The rest of the day panned out to be good as well. 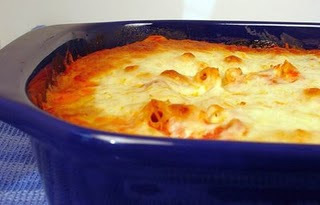 I made a ziti bake for dinner that was delicious. Alia helped me prepare it, and that one-on-one time together was special, especially because we were "creating" together. Chandler did not want to eat it because it contained ricotta cheese; however, he ate it out of sheer hunger and then decided he liked it and wanted more. When Rob returned from services in the evening, he brought me a glass of red wine. Neviyah and I snuggled while watching Dora. It was peaceful and relaxing. Even though I cannot eat bread, and we have nothing planned beyond Passover events and doctor's visits, this vacation has been rich, relaxing, rewarding, and renewing (the four Rs! ).